A kitchen really is the heart of the home. It’s not only where families gather to eat, but also to hang out, play games, do crafts and much more. Choosing your kitchen flooring is a big decision. Durable and easy to clean surfaces are key, but what else should you look for? According to Mohawk, the flooring manufacturer, here are guidelines to help you choosing your kitchen flooring. Ceramic tile gives you style and isn’t a budget breaker. It stands up to a lot of abuse and is easy to clean. Plus it comes in endless color, size, shape and pattern options. Want to create visual interest? Go with porcelain tile. 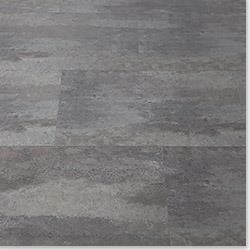 Porcelain is a type of ceramic tile with color integrated throughout it. In addition to the color aspect, high-definition printing can create tile that replicates hardwood or natural stone. They are harder than regular ceramic, which means they are durable but can become uncomfortable to stand on. Hardwoods provide warmth and blend well with other flooring. They are a sound investment that can increase the value of a home. They are not as maintenance-free as tile, but have become much easier to maintain thanks to advancements over the past few years. Laminate provides a less expensive option to hardwoods. Laminate can give you the look of stone, bamboo and wood at a fraction of the cost and isn’t as prone to scratching. It can be installed over existing flooring too. But, it has a shorter lifespan and will not add to a home’s value typically. Vinyl could be the answer if comfort is an issue. 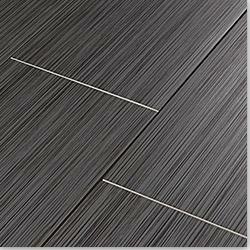 If you spend long periods of time standing in your kitchen, vinyl provides excellent cushioning. It can be installed directly over the subfloor, but could require professional installation. This isn’t your grandma’s vinyl. It gives you a high-end look that’s comfortable too. Mohawk has provided a discount for Keller Williams employees and clients, and I’m passing it along to you! 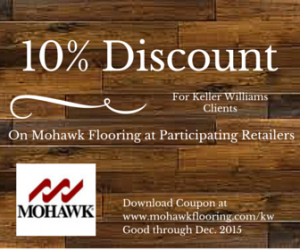 If you need to replace some flooring, use this link to download a 10% discount and locate your local participating Mohawk retailer.